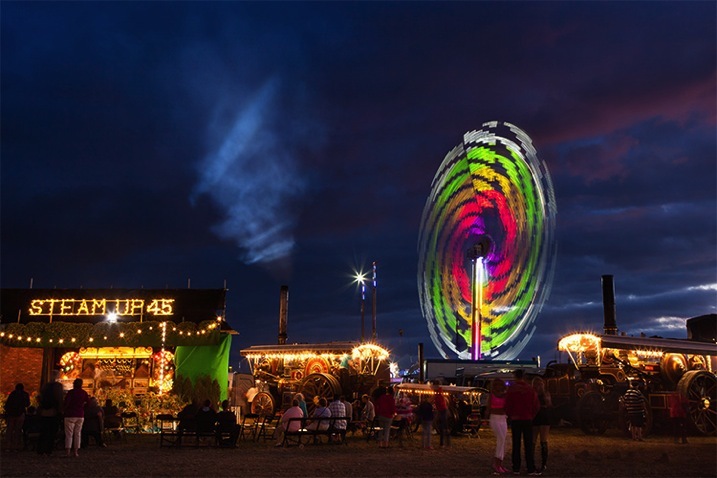 Packed with people, bright lights and fast-moving rides, fairgrounds can provide photographers with loads of opportunities to take some colourful and creative images. So, why not grab your camera, head to your nearest fair and try out some of the following ideas for yourself. Fairgrounds can be fun to take pictures of, whether you go in the daytime, or at night. However, with their bright lights, they really come alive once the sun has gone down. My preferred time to arrive is around one hour before sunset, as this allows you to take a look around before it gets dark, and gives you time to plan your shots. Arriving at this time will also enable you to shoot during the crossover period – the part of the evening where the sun has set, but there is still light and colour in the sky. The deep, dark blue sky provides a striking contrast to the bright, colourful lights and can often look better in photographs than a fully black night sky. In my opinion, this is the optimum time to capture fairgrounds in all their vibrant glory. Whatever lens you choose to take, there should be some great photo opportunities awaiting you. However, if possible, take a variety of lenses to expand the range of shots you can take. A wide-angle will be useful for capturing the action of fairground rides and a telephoto will enable you to crop closer into details, or people on the rides. The accompanying shots were taken using 24-105mm and 70-200mm lenses. When visiting the fair with friends and family, I have also found it useful to take a 50mm (f/1.8) lens so that I cAN take some pictures of them enjoying themselves. 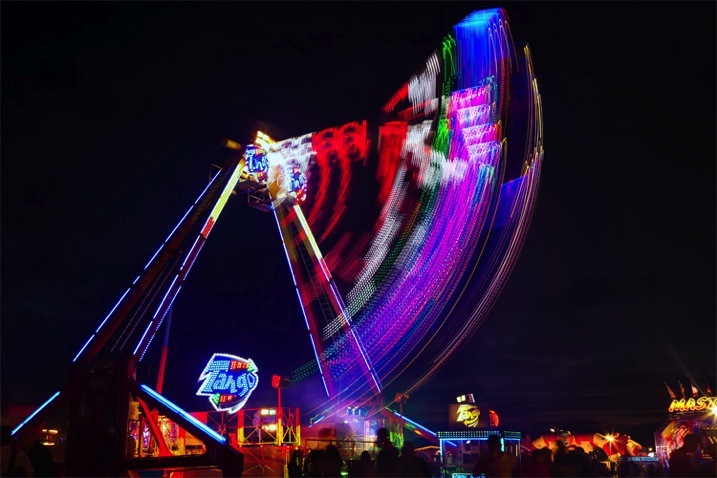 If you’re planning to capture the fairground rides after sunset you are going to need a tripod due to the slow shutter speeds that you will be using. A remote shutter release will also come in very useful to reduce the risk of blurred images from camera shake. 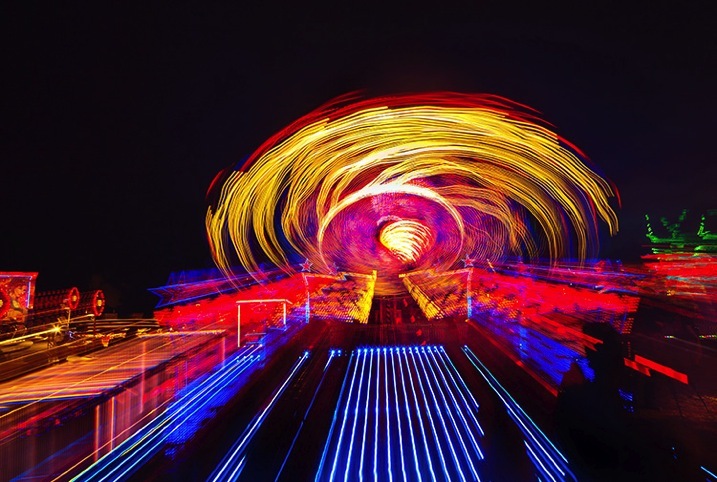 The most dynamic and exciting photographs of fairground rides aim to convey a sense of speed and movement. 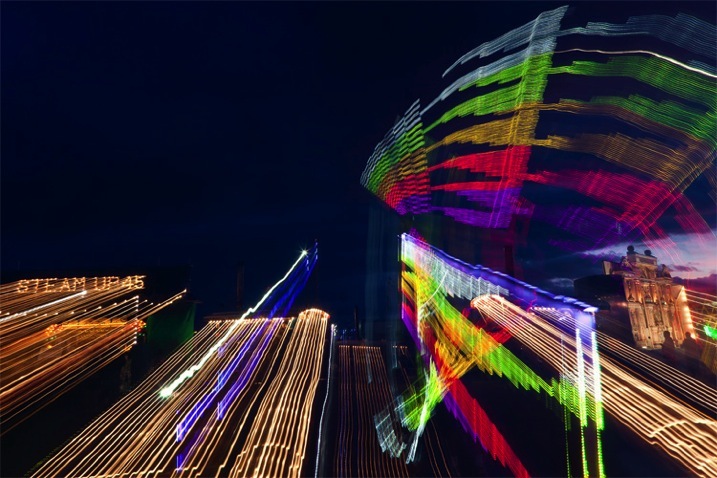 Slow shutter speeds are used to capture the colourful trails and patterns created by the fast-moving lights. They’re fun to take, and you can get some dramatic shots relatively easily. Once you have decided which ride to shoot, fix your camera to your tripod and fit a remote release. (Remember to turn off Image stabilization if your lens has this.) Shutter speed is the most important aspect of getting the correct exposure in this instance, so set your camera to shutter-priority or manual mode. The amount of movement you capture in the image will vary on a number of factors, not least the speed of the ride itself, but a good place to start is with a shutter speed of one second. Set the ISO to the lowest setting available and the white-balance to Auto, as this should be effective in most situations. (For long-exposure shots such as these, I would recommend shooting in RAW so that you will be able to change the white balance settings during post-processing if necessary.) Autofocus may struggle in low-level light, so manually focus on a part of the ride when it is not moving. Take a test shot using these settings while the ride is stationary to check the exposure. Pay particular attention to the sky and, if necessary, use exposure compensation. Then, as the ride begins to move, play around with the shutter speed to see what works best. Anything longer than ½ second should produce a decent amount of motion blur and light trails, the effect does depend on the speed of the ride. Keeping the shutter open for a longer time means that you can capture more light trails and patterns – although sometimes this can result in images with messier light trails and a lack of clear, distinct shapes. Ultimately, your choice of shutter speed will depend on the nature of the ride (how fast and how much it moves – vertically, horizontally, diagonally etc.) and your creativity (personal preferences between clean light trails or chaotic swirls of colour). When composing your shot, give some thought to the angle you are taking it from. Try to get in close and shoot from a low angle, looking up at the ride to minimize distracting backgrounds, but always stay a safe distance from moving rides. Remember to leave enough space in the frame to capture all of the movement so that you don’t inadvertently cut anything off. Spend some time watching how the ride moves before taking a shot. Also, with all the movement going on, try to include a still element in the frame to help ground the image. Signage, fairground stalls, or even (non-moving) spectators can add to the story you are telling in your final image. Fairgrounds are not just about the rides. By providing great lighting and a fun-filled atmosphere, they’re the ideal place to try out some candid photography. Candid shots of people engaging in activities around the fair will be more interesting than shots of people sitting around doing nothing and often will add an element of story to your image. Also, by being focussed on the activity, your subject is less likely to focus on you taking their photograph. This can produce better candid shots because as soon as a person knows they are being photographed, their natural behaviour tends to disappear quite quickly. 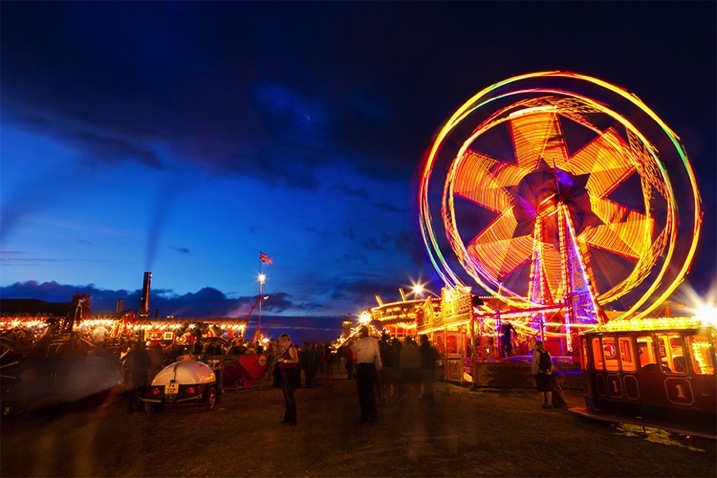 Why not take advantage of all the activities on offer at the fair, and try to capture people’s reactions to the action – whether that is trying to win a prize on a fairground stall, eating one of the many sugar-based treats on offer, or even waiting in line for a ride. When taking candid pictures, set your camera to continuous shooting mode and take a number of shots in quick succession to stand a better chance of perfectly capturing the reaction you want from your subject. Use a wide aperture to let in lots of light. It may also be necessary for you to increase the ISO setting to get the correct exposure. A telephoto lens with a focal length of around 200mm should enable you to capture the (often extreme) reactions of people on fairground rides for some particularly dramatic candid shots. The lighting at fairgrounds can also be great for illuminating people for some posed shots. Colourful lights can produce great background bokeh for fun portrait shots of friends and family. Simply put, bokeh is created by out-of-focus light so you will need a shallow depth of field. Using a very wide aperture will help, but you will also need to think about the distance between the subject and the light sources (the further away the better) and the distance between the subject and your camera (stand close to the subject and use a reasonably long focal length). There is often enough light available from other sources to fully illuminate the subject, but a flash with a diffuser may also come in handy. One of the best reasons to take pictures at fairgrounds is that they’re a great place to get really creative as a photographer and experiment with a range of techniques. You can add movement and drama to your images, even when the rides are not moving. For instance, try to create a zoom burst effect in-camera. Use the slow shutter speed settings detailed previously, then manually change the zoom on the lens, while the shutter is open. Experiment with different shutter speeds and staggered zooms; you may be surprised at how the effect changes. For even wilder shots, try the zoom effect on a ride that is moving – to illustrate the type of effects you can achieve, the two shots below show the same moving fairground ride with the zoom burst technique applied to the second image. A good way to add an increased sense of speed to a slower ride, such as the dodgem cars or carousel, is to take a panning shot by moving your camera in line with the moving subject during exposure. 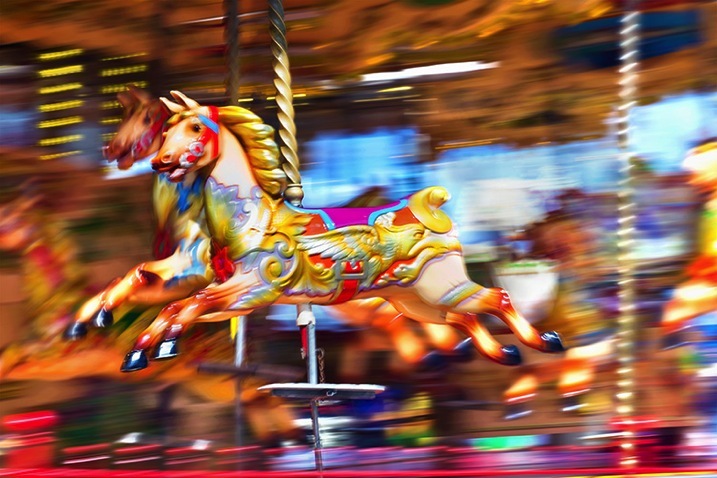 The aim is to keep the subject (carousel horse) as sharp as possible and the background as blurry as possible. Shoot in shutter-priority mode and select a speed of 1/30th of a second to start. You can then experiment with slower speeds depending on the level of light and the speed of the subject. Make sure to shoot in continuous shooting mode and, if your camera has it, use automatic focus tracking. Press the shutter half way to activate the focus tracking when the subject enters the frame. Lock focus on the subject and, as smoothly as possible, pan your camera to match the movement of the subject and take your shots. Finally, when leaving the fair, try to capture the fairground lights as part of a wider landscape shot if possible. 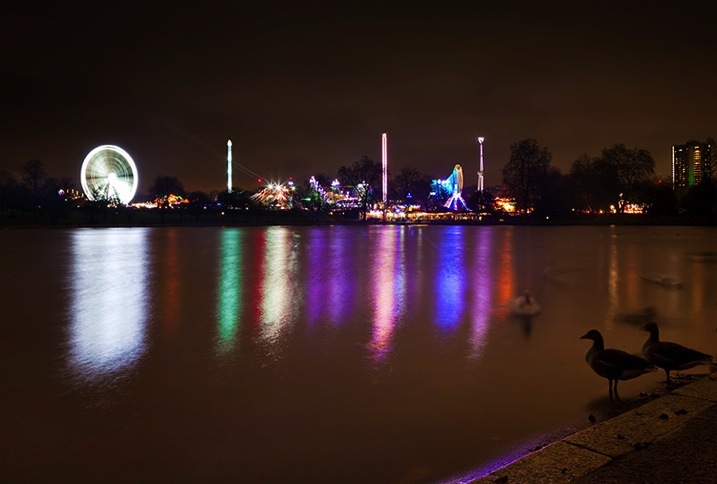 If the fair is anywhere near water (on a seaside pier, for example) look out for the creative potential of reflected fairground lights. 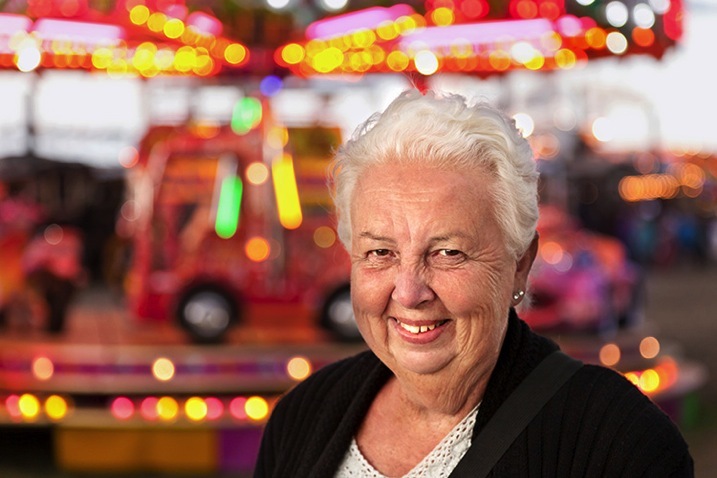 When taking pictures at the fairground, like at any other busy event, stay safe, keep an eye on your kit and remember to have some fun while you are there! The post How to Take Great Photographs at the Fairground by Richard Beech appeared first on Digital Photography School.